This is the fourth post in the Malaysia and Singapore! series. Other posts in this series include Lot 10 Hutong – Kuala Lumpur’s Most Famous Hawker Stalls Under One Roof, LaZat Malaysian Home Cooking, and Otak, Otak Fish Dumplings in Banana Leaf.One of the hardest parts of planning a food-oriented trip in a city I’ve never visited before is coordinating the sightseeing locations with the food. If I am not very familiar with the geography of a destination, I get overwhelmed reading Chowhound posts and various magazine articles which are usually only directed towards what to eat and not so much where they are located relative to the best places to sightsee. As a result, I find myself struggling to connect the dots and overlay restaurant addresses, sightseeing locations, and subway maps. It’s a bit exhausting. I swear, someday I am going to sit down and write a little eating guide for Boston that tells you what to visit and where to eat all in one go. Anyway, I digress. The whole point of bringing that up was to say that we found a lovely little place to dine right in the middle of a heavily-trafficked tourist area in Kuala Lumpur. These twin towers were the tallest buildings in the world from 1998 to 2004, when they were surpassed by Taipei 101. Currently, Burj Khalifa in Dubai holds the record. The Petronas Twin Towers continue to be the tallest twin towers in the world. You can go up the elevator and walk across the Sky bridge (right above Domo in the photo above), as well as take the elevator all the way to the 86th floor to the observation deck at the top (RM 80, about $27 USD). If you don’t feel like doing all those activities, you can still shop in the attached mall called Suria KLCC (Kuala Lumpur City Center). I soon learned something about restaurants in malls in Kuala Lumpur. They are good. Unlike the reputation that mall restaurants often have in the U.S. (mediocre chain restaurants), the restaurants in KL malls tend to be some of the best restaurants around. We entered the fourth floor restaurant area of the mall and saw several restaurants. I saw Chinese, Japanese, Indian, Indonesian, Taiwanese . . . I was in heaven seeing the amazing diversity of Asian cuisines represented. We noticed Little Penang Cafe had the longest line out front. Furthermore, it had pretty good online reviews. When in doubt, follow the lines. Thankfully, the line moved really, really fast. So fast, in fact, that I hardly had time to take a photo of the line. You can see Bryan is actually yelling at me in the photo, telling me to get back in line because the hostess had just called our name. Service was very good. They must be very used to dealing with long lines. A server gave us menus and took our order while we were waiting in line. When we sat down they immediately took our drink order. Enamored by the access to fresh fruit, I ordered a watermelon juice just because I could. Soon after, the food arrived. Char Kway Teow is a Nyonya style noodle dish that consists of flat rice noodles stir fried in a wok over high heat with shrimp, bean sprouts, Chinese chives, egg, chicken in a gloriously flavorful sauce made with hot chili, belacan (fermented shrimp paste), and soy sauce. Here it is served over a banana leaf. This was one of our first meals in Kuala Lumpur so we had nothing with which to compare it, but we loved it. It exploded with flavor, had a nice smoky wok “char”, and the noodles had a good texture. 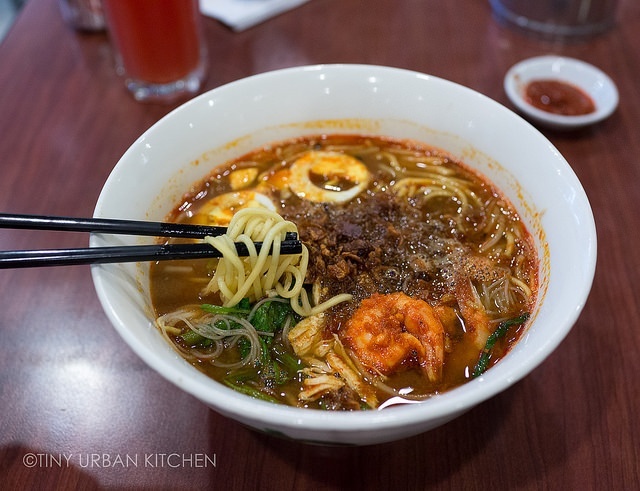 Penang style Hokkien Mee is a prawn noodle soup. The flavorful stock is made with dried shrimp, prawn heads, white pepper, and garlic. You get a choice of yellow noodles or vermicelli. I wasn’t sure, so the server said, “why not both?” I said “sure.” You can see both noodles in the photo. The soup was fantastic, so richly full of so many complex flavors. The shrimp was a bit overcooked, but other than that it was very satisfying. Pie Tee (also known as kueh pie tee or kuih pie tee) caught my eye the moment I saw a photo of it on a placard outside the restaurant. These are tiny deep fried crunchy spring roll cups filled with your typical popiah filling of jicama, carrots, and deep fried shallots. They were delicious little bites that burst with flavor. All in all we had a lovely meal at Little Penang Cafe. It’s a perfectly fine choice for lunch if you happen to be visiting the Petronas Twin Towers and the KLCC area. If the lines are too long for your liking, you can also consider checking out Madam Kwan’s, another restaurant on the same level. Bryan ended up eating there the following day with coworkers (I think he had their signature nasi bojari fried chicken dish) and he said it was pretty good. Unfortunately, I have no photos from that meal since I wasn’t there! Afterwards, if it’s not too hot outside, walk over to Bukit Bintang (10 minute walk away), one of the liveliest shopping districts in the city. Hi Jen, been reading your blog for the last 1-2 years. Love your recipes and travel posts! “Following the lines” when in another country is such a great idea. In America, I find I don’t like what is most popular, so instead, I look for little “hole in the wall” places and just go with my gut instinct. thanks for the tip!